The missing link between simple and complex cells? 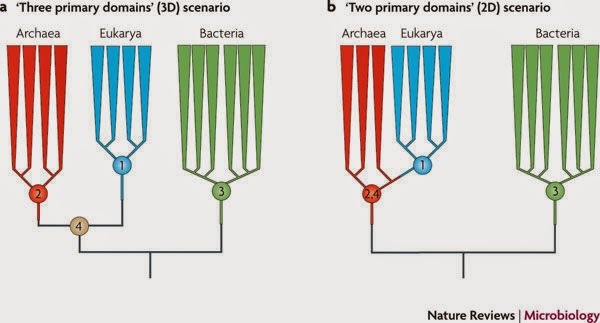 There has been significant controversy over whether the archaea evolved ‘gigantism’ as cells and then subsumed bacteria that became mitochondria and chloroplasts – to create eukaryal cells, or whether they evolved as separate lineages form a more distant ancestor (see Nature Reviews Microbiology 8, 743-752, http://www.nature.com/nrmicro/journal/v8/n10/full/nrmicro2426.html). The new study offers evidence that archaea indeed do represent an ancestral state, with a monophyletic lineage between the newly discovered archaeal phylum Lokiarchaeota and euakrya. The phylogenomic evidence is quite compelling, with GTPases (involved in phagocytosis, a eukaryal trait) and actins (implicated in complex cell structure) suggesting the new phylum represents a ‘starter kit’ towards greater cellular complexity and eventual eukaryal cells. Coupled with the ribosomal genes showing the greatest affiliation to eukaryal ribosomal genes of any archaea studied to date – this makes a fairly convincing story. Of course nobody is suggesting that the Lokiarchaeota, discovered near a deep sea hydrothermal vent off the Norwegian coast, are an extant missing link. 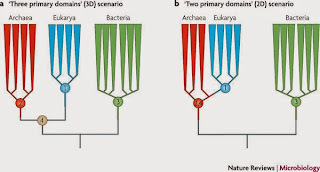 Rather the evolutionary relationships suggest that the ancestral state did exist and can reasonably be expected to represent a transitional stage towards eukaryal cells.